Brother Industries Ltd has been spending much resource in developing a new technology with the name of RID (Retinal Imaging Display) so that images can be projected directly into users’ retina for pleasurable viewing experience without depending on external display panel or device. Besides being able to beam the image into human’s retina safely, there is another major technology breakthrough that have able to shrink down the physical size of the necessary modules, making them practically to be used while moving around. You may have heard or seen this technology as the company did show a static demonstration during EXPO 2005 few years back. And after four years of intensive research effort with continuous improvement, Brother has able to reach another major milestone with a working live demonstration while able to downsize its original bulky box type into wearable spectacles suitable for more practical usage. Basically, the prototype consists of three basic modules namely light source, eyepiece as well as an optical scanning module and among all of them, light source module which contains laser lights is the most bulkiest one and good news now, the company has able to bring its size down significantly by one thousandth to merely 350gram as compared to predecessor design without impacting its image quality. 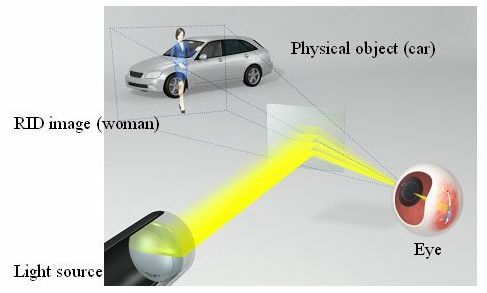 No pricing information yet, the prototype is expected to be commercialized by 2010 suitable to various usage models such as reading confidential data, viewing the RID images while still able to stay focus on original visual field besides enjoying large projection image (virtually equivalent to 800 X 600 resolution at 60Hz frame rate) on the go.